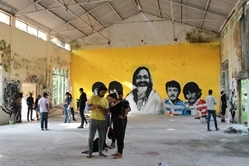 NEWS Beatles in India: 50th anniversary of quest for inner peace . Beatles Radio: The Beatles, Solos, Covers, Birthdays, News The Fab 4 and More! The year was 1968. Four hallowed visitors left the speedy life of London and reached Rishikesh, a city in India's northern state of Uttarakhand, located in the Himalayan foothills besides the holy river Ganges. Beatlemania was in full swing then, but the Beatles themselves were grief-stricken over the sudden death of their manager and struggling to reboot their identity. They were to learn Transcendental Meditation in the ashram of Maharishi Mahesh Yogi in a quest to find some inner peace. The spiritually inclined George Harrison and John Lennon arrived in New Delhi on Feb. 16 and took the road towards the hill city for Maharishi's ashram. Close behind them were practical-minded Paul McCartney, who was less sure about giving up his music and fame for an illusive mystical path, and Ringo Starr, the band's good-natured drummer, carrying suitcases full of Heinz baked beans in case the ashram's food failed to satisfy his appetite.